As Prime Minister Alexis Tsipras met in D.C. this week with President Donald Trump, the specter of non-performing loans continued to hang over the Greek economy. The Europeans finally agreed a couple of weeks ago with the International Monetary Fund to begin stress testing the country’s four systemic banks, Alpha Bank, Eurobank, National Bank of Greece, and Piraeus Bank, which constitute 98 percent of the Greek financial system. This reflects two things. Either creditors’ frankly doubt these banks’ ability to finally stand on their feet and finance a much-needed strong economic recovery, or they are determined to keep on pressing the government for more reforms by questioning financial sector’s capitalization and quality of capital. Or both. In any case, one thing is certain. Greek banks cannot currently finance domestic recovery, which, by the way, remains insufficient and anemic. The issue became critical during the week of October 9, when the IMF’s World Economic Outlook predicted poor long-term growth prospect for Greece. As for 2018, the IMF made clear that, if Greece succeeds in reaching the specific target of a 2.2 percent budget surplus and implements the planned reforms, then it will not raise the specter of new austerity measures. Getting rid of non-performing loans (NPLs) valued at 100 billion euros is substantially now the number one priority for the IMF. Meanwhile, the government agreed with European creditors back in 2015 to reach a target of 3.5 percent. The Europeans, by the way, unanimously reject the imposition of a new direct ‘haircut’ for Greek debt holders. This European stance seems to imply that, to attain a primary budget surplus of 3.5 percent of GDP or higher, the Greek government has to undertake new austerity measures that would shave off the equivalent of 1.3 percent of GDP. Or simply frontload in 2018 the implementation of the new 20 percent pension cuts, estimated 1.2-1.3 percent of GDP, scheduled initially for 2019. In this case, it is certain that Alexis Tsipras, Greece’s maverick prime minister, will call for early elections possibly by next June. 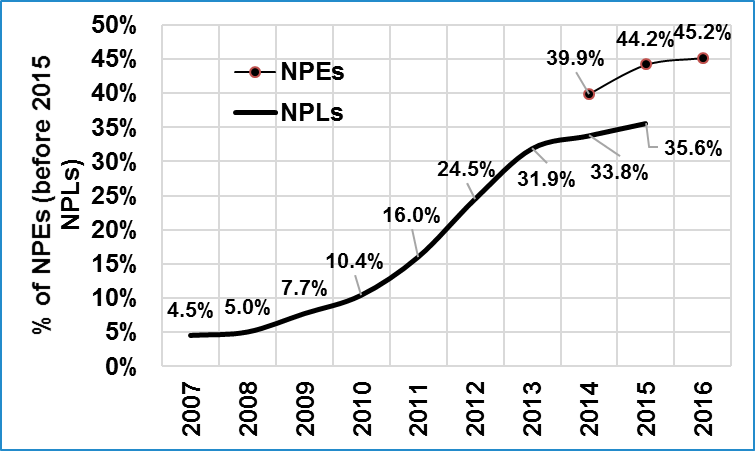 In the meantime, the financial sector is trying to deleverage by getting rid of as many NPLs as it can. This is a top policy priority for creditors, including the Europeans and the IMF. On the plus side, households and companies with strong financial standing have paid off some of the loans. However, restoring the loan to deposit ratio to a sustainable level and steadily reducing reliance on the euro area’s lifeline as the economy deleverages remains challenging. While the repeated recapitalizations have restored the capital base of Greek banks, NPLs have increased steadily as a share of outstanding loans. Surely, by now many jobs have been lost, and myriad companies that were essentially productive have failed. Given more acceptable terms of financing, some of those companies would likely have weathered the crisis intact. In the absence of an economic depression, others might have failed as part of the broader integration into global value chains and as rising non-wage productivity transforms the corporate landscape. But the depression did happen and Greek banks’ gradual normalization occurred in tandem with a rising ratio of NPLs, as both crept upward even as the institutions relied on the euro area lifeline. The fact that the fiscal crisis in Greece turned into a depression within the context of a financial system that had not lent excessively to households and companies contrasts starkly with other European countries where excessive private debt was channeled towards non-productive real estate projects. In Ireland and Spain, for example, there was little value to recover from overpriced and ill-conceived real estate projects. By contrast, Greece had no widespread debt-driven real estate bubble or consumer debt overhang. Instead, loans were offered to productive companies exactly because the weak institutions (which implicitly afford only weak creditor protection) discouraged unconditional lending. This also surfaced after the unprecedented series of audits in the loan portfolios of Greek banks. To the surprise of many, these audits showed that loans were in general offered based on a sound assessment—when political influence did not force loan officers to override their sound judgment, especially in state-controlled banks. This means that, even while NPLs now seem to have peaked, reflecting the gradual easing after the latest spike of uncertainty during the political events of 2015 and 2016, the share of corporate NPLs forms a disproportionally large part of such loans. Comparatively speaking, in Ireland and Spain, mortgages were respectively the largest group of such loans. Furthermore, in 2014 a large share of such loans was backed by some activity that could be restored to health, at least partly, conditional on the implementation of a successful restructuring. This is true even today. Yet, as time passes, the number of companies that can recover, overcome rising arrears, and cope with the erosion of their network of customers and collaborators, dwindles. The slow resolution of NPLs relates to the resurgence of instability after December 2014 as well as to the inflexibility of the related laws. 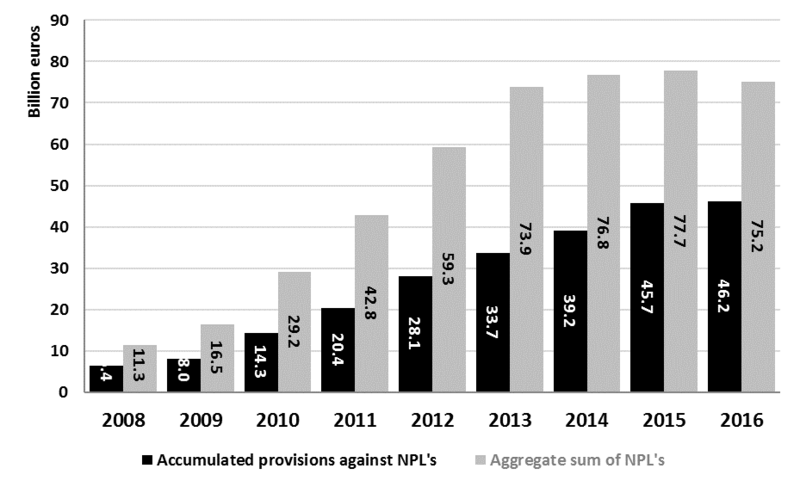 This has contributed to the fact that the Greek banks have been accumulating such NPLs on their balance sheets even while they have been taking generous provisions against them. In the end, the sum of collateral and provisions should cover any potential losses in most, if not all, of these NPLs—even at the current values of depressed collateral like real estate. But, beyond political and economic stabilization, an encompassing legislative initiative is needed, yet, to date, progress has been partial at best. This begs the question of why creditors are not pushing for an arrangement that could liberate resources both for small and big domestic companies still surviving amidst this mess. Part of the text including data is taken from the forthcoming 2nd edition, with three more chapters, of my book (co-authored with M. Mitsopoulos) Who’s to Blame for Greece? How Austerity and Populism are destroying a country with high Potential.